The Pro's of Engineered Marble Flooring - The Perfect Flooring Solution. Why Should I Used Engineered Marble for My Flooring Project? Style & Practicality: The biggest advantage of and engineered marble flooring area is that it can instantly elevate the appearance of a space, giving it a regal bearing that is hard to imitate. At the same time, marble is available in multiple colors, and even in stunning multicolor mixes, providing flexible options for a variety of decorative schemes. Tiles can also be cut to rectangles, and triangles of varying sizes, in order to create complex mosaic piece installations. Polish: Unlike most natural stones, marble is able to take a very high polish, getting silky smooth and shimmering when treated properly. This is a look of sophistication and glamor, that evokes the highest sense of elegance in a space. It’s also a truly distinct look, which can make a difference when trying to create a flooring installation that really stands out. The single largest difference between traditional marble flooring and engineered marble flooring is the ability to simply polish the engineered marble surface after intensive use to regain its original shine. Something that other marble bases simply can not offer, as engineered marble can. Radiant Heat: Marble is a great conductor of heat, making it eligible for a variety of below surface radiant heating systems to be installed. This can infuse the tiles beneath your feet with a rush of cozy warmth that can be thrilling, especially on cold wintry mornings. In some cases it will also be possible to install radiant cooling systems that will chill surfaces down on sultry summer days. Unlike 100% natural marble flooring, engineered marble is cost-effective thanks to its unique design and composition. 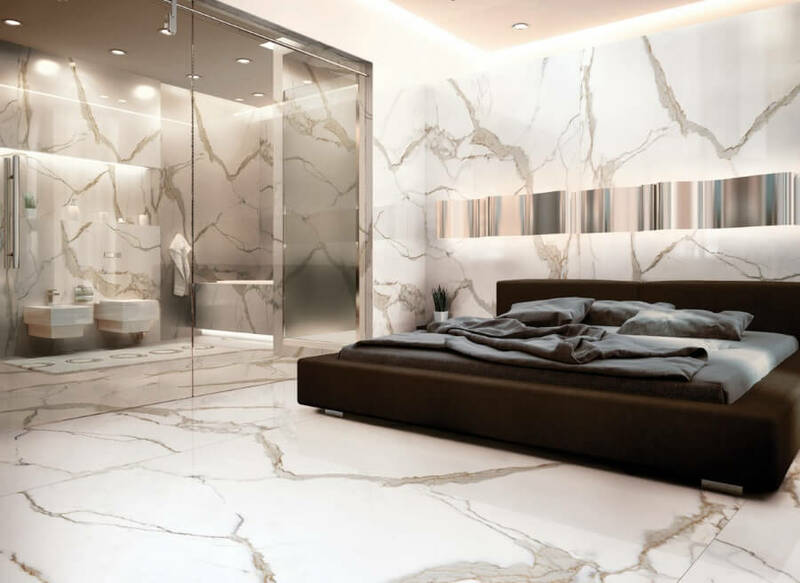 Containing up to 95% natural marble, plus environmentally friendly binders and resins make for a far more economical choice when considering marble flooring solutions. Secondly, because of its uniformity and batch numbers, replacement tiles can be replaced from the same batch as the original, laid marble meaning that consistency of colour and style will never be an issue with engineered marble. Thirdly, engineered marble can be dry laid. Unlike marble flooring where a vein is present, engineered marble can be dry laid with no need to vein, colour or style match.